It’s not exactly a traditional bar/arcade combo. It’s not exactly a Japanese restaurant. 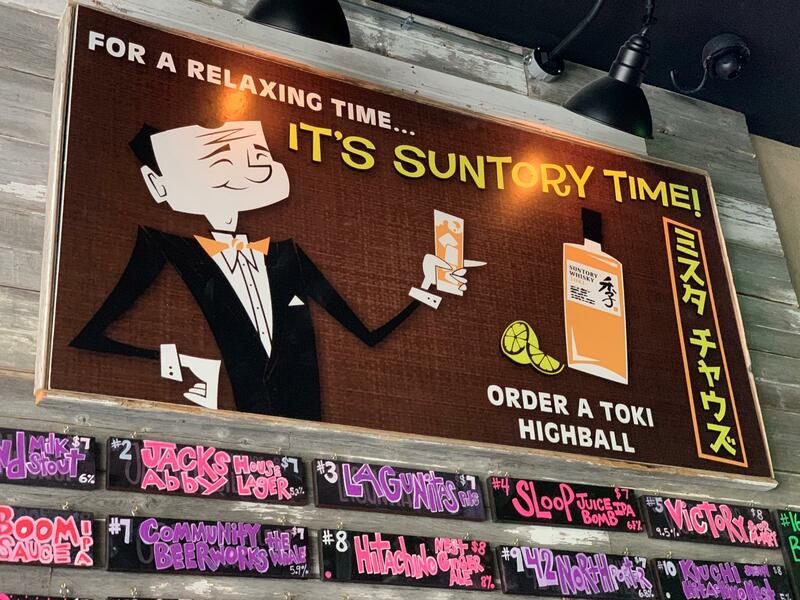 It does however serve sushi, Japanese whisky, and ramen while featuring an entire floor of old arcade games and pinball. So what is Misuta Chow’s? It’s one of Buffalo’s newest experiences to hit Main Street. WBFO’s Nick Lippa reports. WBFO's Nick Lippa visited Misuta Chow's to see what has caught the attention of many Buffalo bar dwellers. There is no space left unused in Misuta Chow's. Downstairs feels like a Japanese alleyway. Close-quarters with the bar upfront and restaurant seating in the back. Upstairs lies another bar with a full arcade. They’re connected by a 'Hello Kitty' sparkle-infused pink staircase. Co-owner Christi Allen said interest in the establishment’s aesthetic is drawing increasingly large crowds since they opened this past July. 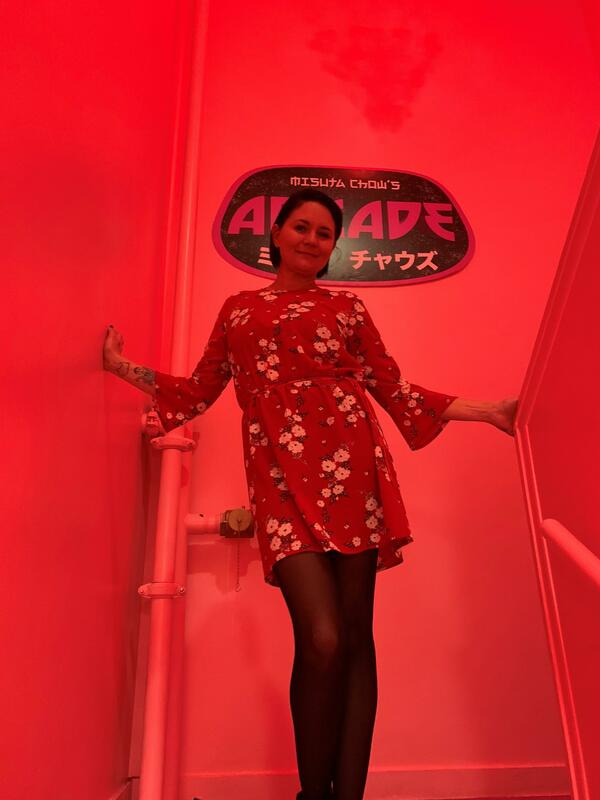 “We really just want people to come and enjoy the experience of being transported from downstairs, which is kind of inspired by the original Blade Runner, and then all the way (upstairs) to this nostalgic 80s concept with the classic games and all of the different neon,” Allen said. The games, according to co-owner Johny Chow, elicit the feeling of growing up decades ago. They originally thought they were going to have to purchase all the games. 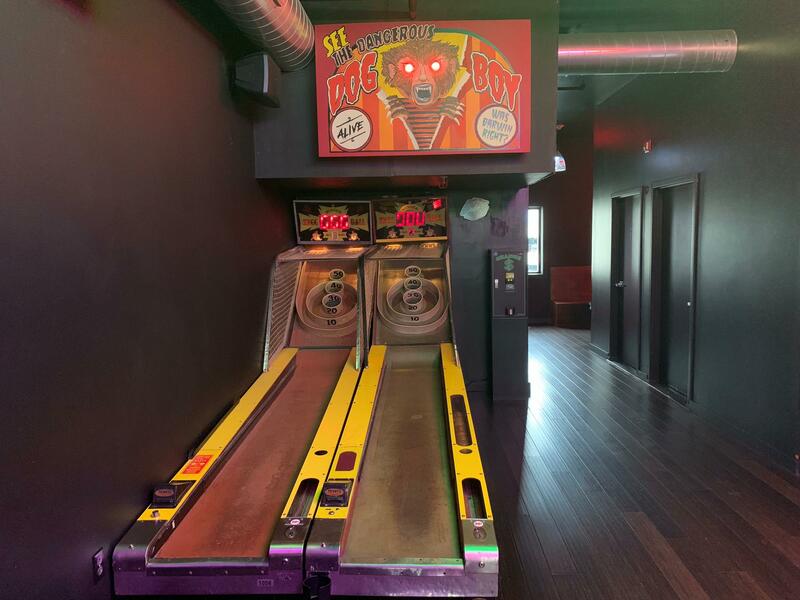 After months of research, they connected with Buffalo Pinball and Arcade Company. That led to a whole line of music themed pinball machines, which you can pay for with cash or an app on your phone. There is pinball and ski-ball, but also classic cabinets like Street Fighter II, Double Dragon, Tetris, and Pac-Man. Chow plans to keep rotating them. It’s even become a date night location for those looking to have a night on the town. Spend some time in the arcade and it won’t take long to see some very engaged customers. Johny Chow talks about some of the Japanese Whisky he brings in... including a very very expensive bottle he keeps in a safe. This is the first establishment Allen and Chow have owned themselves, but both have years of bar experience. Chow started as many homegrown restaurant owners do—as a dishwasher at his uncle’s place. Chow came to fame as a musician and is currently the bassist for Stone Sour. “Bar owners usually like it because when I am off tour, all the bands that I’m on tour with usually are still out on tour doing something like that and they are always coming in to visit me at the bars,” he said. Chow met Allen in California. She has been in Buffalo for about nine years now. Since then, she has helped open Allen Burger Venture, Thin Man Brewery, Black Rock Kitchen and Bar, and the new Coulter Bay. One important factor in choosing a location was finding an area that boasted several bars in walkable distances. Allen says being so close to the Metro Rail is also a benefit. And the masses are coming out, but oddly enough, it’s for the pink staircase. Misuta Chow's has already exceeded 6,000 followers on Instagram. “All it is, is a way to get from one floor to the other. And we’re like, ‘Why not make it all pink?’ And then Christi said, ‘Why not make it all pink with Hello Kitty sparkles?’ Next thing you know it’s like this total Instagram selfie spot,” said Chow. “We knew it would be different and kind of cool and weird and what not, but we didn’t think it was going to be as crazy as it’s become. To a point where, I’ll walk in some days, just to come in to the business, all of a sudden there’s a guy there with a light. Another guy with his professional camera. There’s two models and the staircase and I’m like, ‘Did you guys call and ask us about doing a photoshoot here?’ It’s pretty crazy,” Chow said. “We’ve had wedding parties come in. They’ll just literally pull the limo in the back parking lot. Run in, take their wedding photo, and just run out. It’s a trip. We’re actually thinking about doing a donation box for the pink staircase and picking a different charity to donate that to each month,” he said. Realistically there are a bunch of factors that played in to the restaurant blowing up in popularity. Allen credits 1980s nostalgia being recently embraced at corporate levels. Less than a year old, Misuta Chow's continues to grow. A late night menu featuring a ramen burrito has been added to accommodate late-night city dwellers and ski-ball tournaments are soon to come. They’re just more unique aspects to help Misuta Chow's stand out in a sea of Buffalo bars. Are there too many bars along Allen Street? 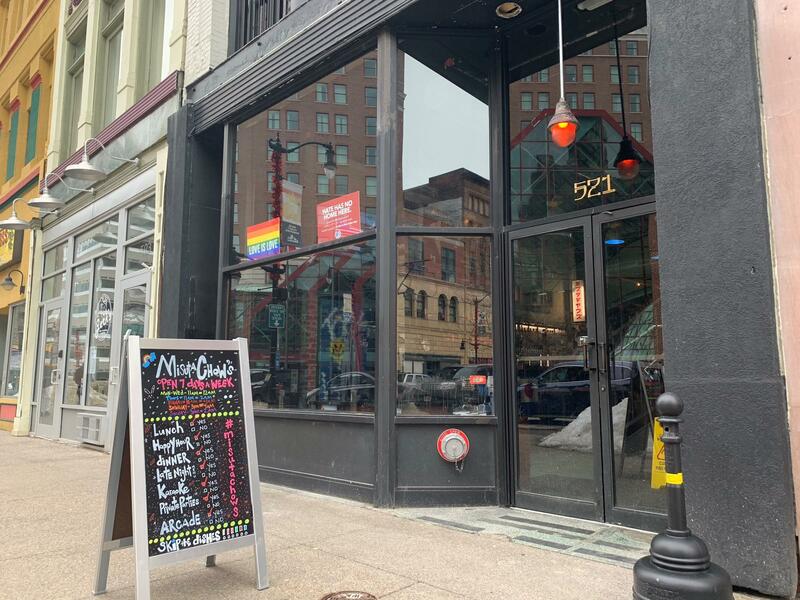 Pushed hard by Allentown residents, Buffalo's Common Council is now shoving back against the long and slow expansion of bars along Allen Street. What do you get when you mix two Gameboys, a guitar, and a composer inspired by bands like Metallica? Buffalo’s own Daniel Behrens, who is more commonly known as Danimal Cannon. He came to the WBFO studios to play some songs and talk to Nick Lippa about chiptune music, including a fully chiptune version of the All Things Considered theme.